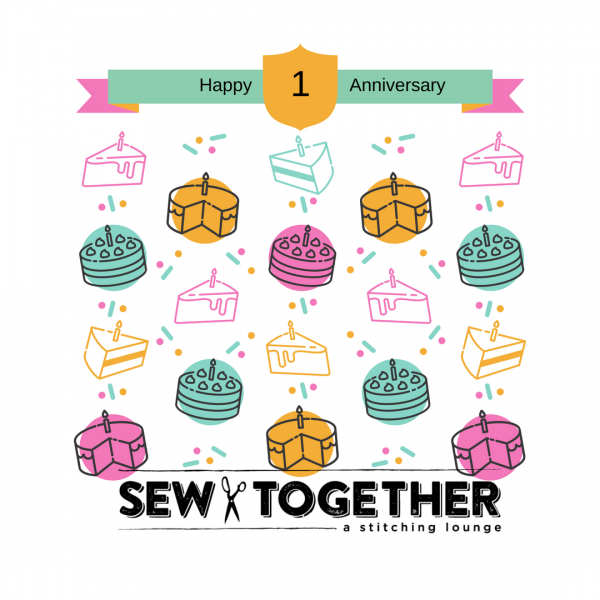 1 year of Sewing Together! Join us for bubbles and cake. The store is closed on Mondays, but you can shop the SALE online. Sip on bubbles while you shop on Saturday. Come and get your fabrics while they are hot! Stock up on holiday fabrics too. Our 4 Acts of Summer Sewing featuring the 100 Acts of Sewing Patterns in July was a huge success. 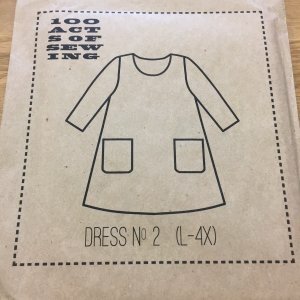 Many people made their first garments this summer! Everyone did a great job and we had lots of fun teaching these simply awesome patterns. We added a Dress no. 2 class in August and it sold out in a week! 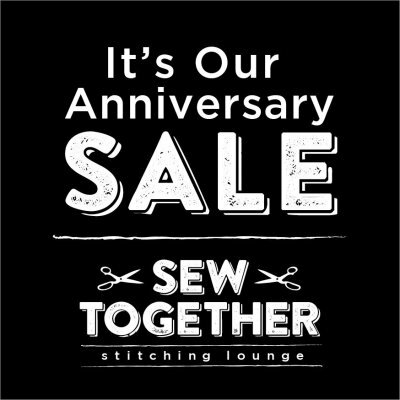 It has been an incredible journey over the last year from concept, to finding the perfect space, with the love and support of family and friends, and meeting sewists and quilters from near and far that fill our days with constant creativity. Here are some of the high notes. These big highlights have brought friends from near and far together to share their love of textiles and creative pursuits. We love supporting our amazing friends who write books and design fabric and patterns. Quiltcon, along with our neighbor LAX, brought many new people and old friends to our door and continues to do so. Xena, our Innova Longarm, was delivered by the Easter Bunny and we now offer edge to edge longarm quilting services. We can quilt your quilts!!! Debra Crain has been our specialty teacher and champion. She happily shares her quilting expertise and abundance of ideas to bring something unique to the store. Summer camp was great fun. Kids will humble you with their creativity and the freedom to make without striving for perfection that can trap us as adults. They simply know how to have fun. Summer Sewing introduced garment making to a whole bunch of people. They are hooked and we are on the hustle to create new classes for garments as well as quilting. On the day to day level, we have the privilege of working, teaching, and serving an amazing array of artists, crafters, sewists, and quilters. We love watching the spark ignite in the new sewist and we love interacting with skilled craftspersons in their element. It truly brings us joy and is the best part of our days. Let's be real for a moment. There are lows in running a brick and mortar store in an online world and a big city. We fight the battle everyday. The reality is if you don't come and shop with us, Sew Together, and other independent retailers that make your community and experience unique won't be able to survive. As lovers of textiles and people of craft we know how important the tactile experience is in what we create and make. In addition, there is the community factor where we can come to together to share ideas, advice, techniques and knowledge. Most of you are familiar with this story as you have seen many quality fabric stores close in the past few years. Many of us are dedicated to slow sewing and craft. Making a quilt takes days, months, or years to complete. This same attention to detail has to apply to your suppliers as well. Most of you know this story and we love and appreciate our ardent supporters who have this intention and make the drive and effort to shop with us rather than click a button from the convenience of their computers. However, we do have this option with our online store!! As we are not a warehouse, we do not have the capacity to carry every single bolt of fabric in a collection. The collections we carry are thoughtfully curated and we appreciate when you check to see what we have in stock before shopping elsewhere. Our hope for the future is for Sew Together to become an established place in our community that thrives for years to come. Thank you for helping us fight the good fight with your continued support and in keeping this sewing community vibrant and thriving. Again much gratitude and love for helping us make this 1 year milestone. It is because of all you wonderful people that Sew Together is the success it is today. We hope for bigger, brighter, bustling days to come in year 2. Please come and celebrate with us this Saturday! We will Sew Together soon.